(Nanowerk News) One of the best ways to watch the complex workings of living cells is to label components, such as DNA segments, with fluorescent probes—small molecules with active optical properties. Then, using a fluorescent microscope, movement of the labeled DNA can be tracked through the entire lifespan of a cell without disruption. Unfortunately, conventional probes are always ‘on’—emitting fluorescent light—regardless of whether the target nucleic acid is present or not. Now, Akimitsu Okamoto and colleagues from the RIKEN Advanced Science Institute in Wako have designed new fluorescent probes that turn on only when a specific nucleic acid strand is recognized ("Exciton-Controlled Hybridization-Sensitive Fluorescent Probes: Multicolor Detection of Nucleic Acids"). Because these probes can be labeled with different fluorescent colors, it is now possible to image multiple processes in a cell simultaneously. Okamoto’s probes comprise a pair of identical fluorescent dye molecules, linked together by a Y-shaped organic chain to a DNA strand. When the probe is not attached to an RNA target, it is in the ‘off’ state and emits no fluorescent light. This is because the two dye molecules stack parallel to one another such that they can access each other’s electronic states, suppressing the fluorescence through what is known as an excitonic interaction. When the probe encounters a complementary RNA strand, however, it undergoes hybridization and forms a double helix. In this configuration, the two dye molecules on the probe become separated and stack between groups in the double helix. Immediately, fluorescence is restored and the probe turns ‘on’. Okamoto and his team found that by adding different types of dyes to the ‘on–off’ probes they emitted distinct fluorescent colors after hybridization. Using this technology, the researchers set out to visualize, in real-time, microRNAs, which are small nucleic acids that regulate gene expression. In their experiment, three types of microRNA strands were injected into a living cell. 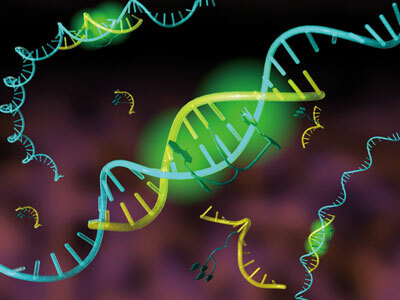 Then, three probes were added; each one complementary to one of the microRNA strands. Fluorescence in three different colors was instantly seen in the middle of the cells (Fig. 1), demonstrating successful recognition of multiple targets. According to Okamoto, while scientists know how RNA is synthesized, spliced and transported within a cell, much of this information is fragmented. Correlating this knowledge with time-dependent, multicolor imaging will help clarify gene expression mechanisms in living organisms.